At the Dialogue, The Council released its study 'Sustainable Development, Uncertainties, and India's Climate Policy: Pathways towards Nationally Determined Contribution and Mid-Century Strategy’. This is the first-in-depth modelling-based analysis of India’s energy and climate policy and presents insights from uncertainty assessment of 220+ scenarios. The future of coal, solar, and other energy sources in India's electricity generation mix for up to 2050. The cost implications of integrating solar and renewable energy into India's electricity generation mix. The implications of uncertainties related to energy efficiency improvements, as well as a higher rate of energy demand growth in the end-use sectors for India's emission intensity. India's progress towards 'Nationally Determined Contribution' targets related to non-fossil energy's share in electricity generation capacity, as well as emission intensity of GDP. The transformation required in India's energy systems to achieve some 2-degree C compatible pathways, and insights for Mid-Century Strategy. The synergies and trade-offs between stringent climate policy and sustainable development. 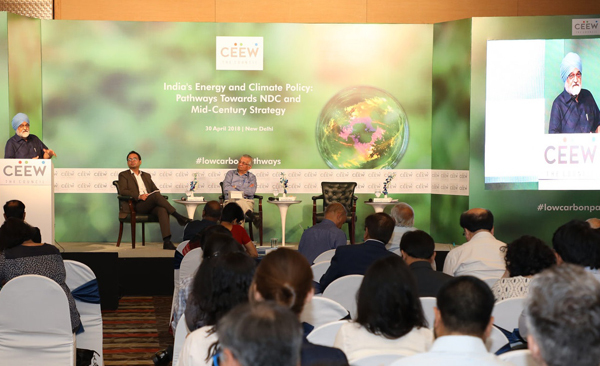 In his opening remarks, Dr Anil Kakodkar, Trustee, CEEW, and Former Chairman, Atomic Energy Commission, said, "India's future energy mix must focus on universal energy access, social development, and economic growth. We must consider nuclear energy, as it is the only reliable non-fossil fuel source of electricity. All other energy sources are unpredictable and variable. We need to set up 20 nuclear plants with a 32 GW capacity, with international collaborations. In addition, we must focus on other technologies, including coal-bed methane, coal gasification, splitting water for hydrogen, solar thermal, etc." During his keynote address, Mr Montek Singh Ahluwalia, Trustee, CEEW, and Former Deputy Chairman, Planning Commission, Government of India, said, “Historical responsibility matters and we need to build a basis of differentiated responsibility. In recent years, climate change discourse has seen the focus shift to renewable energy. Going forward, equal importance must be given to energy-efficient technologies. I compliment The Council's research focusing on internalising our longstanding sustainability goals." India’s NDCs can be enhanced – if policymakers find solutions to the crucial question of who will pay the cost of integration and other costs. Non-fossil fuel energy sources will garner a share of at least 48 per cent in India's electricity generation capacity by 2030. The energy sector carbon dioxide emissions intensity of GDP will decline by at least 48 per cent between 2005 and 2030, on the back of significant developments in energy efficiency of end-use sectors such as residential, transportation, and industrial sectors. Cost of integrating variable renewable energy into the electricity grid is a key element of India's energy transition to a low-carbon economy. To be consistent with the 2 Degrees C target, India needs to cut CO2 emissions by at least 4.5 per cent per annum post-2030 to adhere to an emissions budget of 145 GtCO2, based on techno-economic analysis. While meeting climate commitments, implications for energy access, jobs, industrial competitiveness, and water are important for informing the mitigation choice.